The Raiders tendered Carlson to an exclusive-rights contract Thursday, Michael Gehlken of the Las Vegas Review-Journal reports. 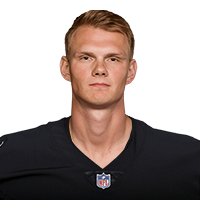 Analysis: He only attempted 17 field goals over 10 games with the Raiders last season, but Carlson nonetheless set a franchise record for accuracy (94 percent) while drilling all three of his tries from 50-plus yards. While he'll now stick around in Oakland on a cheap contract, the Raiders offense will need to attempt more than 1.5 field goals per game for Carlson to surface on the fantasy radar. Carlson made his lone field-goal attempt from 50 yards during Sunday's 35-3 loss to the Chiefs. Analysis: Carlson was a rare bright spot for the Raiders during Sunday's blowout loss in Kansas City, as the rookie remained perfect from 50-plus yards. 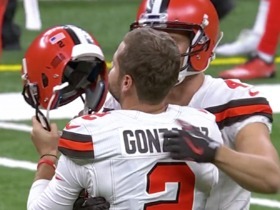 The Auburn product had quite an impressive turnaround following his release from the Vikings, connecting on 16 of 17 field-goal attempts in 10 games with Oakland. Carlson should be brought back by the Raiders in 2019 while the team looks to revamp its offense in the draft with additional weapons to surround quarterback Derek Carr. Carlson connected on field-goal attempts of 43 and 45 yards and also drilled three extra points in the Raiders' 27-14 win over the Broncos on Monday. Carlson converted all three of his field-goal attempts and made his lone extra-point try during Sunday's 30-16 loss to the Bengals. Analysis: Carlson is now a perfect 2-for-2 from 50-plus yards since becoming a Raider, but also has been perfect in five straight games since the team's bye week. The rookie appears to have put his early-season struggles in the rear-view mirror as a Monday night showdown against the Broncos approaches in Week 16. Carlson converted his lone field-goal attempt from 44 yards and made all three of his extra-point tries in Sunday's 24-21 win over the Steelers. Analysis: Carlson has now made all seven of his field-goal attempts over the Raiders' past four contests, finding a groove after a brutal start to his rookie campaign. Oakland's offense also has displayed improvements with 57 total points the past two weeks, providing Carlson with additional opportunities to collect points of his own. Carlson converted both of his field-goal attempts and all three of his extra-point tries during Sunday's 40-33 loss to the Chiefs. Analysis: Carlson made his first career field-goal attempt from 50-plus yards Sunday, and he also connected from a respectable 44 yards out as well. The rookie has remained perfect throughout the Raiders' past three contests and will look to maintain momentum against the Steelers in Week 14. Carlson connected from 42 yards and made both of his extra-point attempts in Sunday's 34-17 loss to the Ravens. Analysis: Carlson has not missed a single kick in three consecutive games, which is quite an improvement for the rookie after missing four of his first five career field-goal attempts. 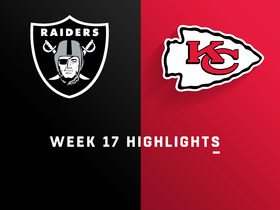 A Week 13 matchup against the Chiefs could become a high-scoring affair, but the Raiders may be playing from behind once again. Carlson converted all three of his field-goal attempts and both extra-point tries during Sunday's 23-21 win over the Cardinals. Analysis: Carlson logged his second consecutive perfect game and played a key role in securing Oakland's Week 11 victory. The rookie fifth-round pick will look to record another solid outing against the Ravens on Sunday. 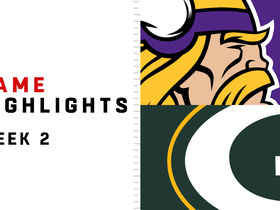 Carlson made both of his field-goal attempts in Sunday's 20-6 loss to the Chargers. 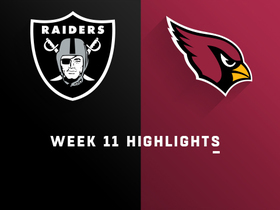 Analysis: Carlson was perfect from 46 and 30 yards to give the Raiders their only six points of the contest, as the team's struggling offense failed to reach the end zone. There could be a lack of scoring opportunities again in Week 11 against a Cardinals defense that just held the Chiefs to a season-low 26 points. 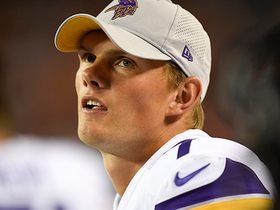 Carlson made one of two field-goal attempts in Thursday's 34-3 loss to the 49ers. Analysis: Carlson has been held to just seven total points in two contests with Oakland, having missed from 45 yards during the Raiders' brutal performance Thursday night. 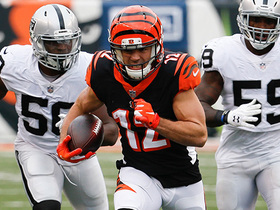 The offense could struggle to move the ball again in Week 10 against the 6-2 Chargers. 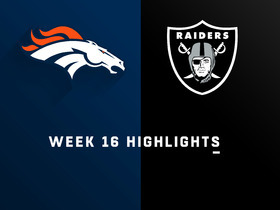 Watch the highlights from the Week 16 matchup between the Denver Broncos and the Oakland Raiders. 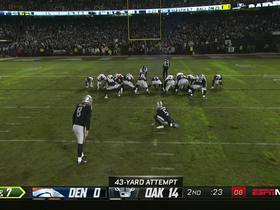 Oakland Raiders kicker Daniel Carlson makes a 45-yard field goal. 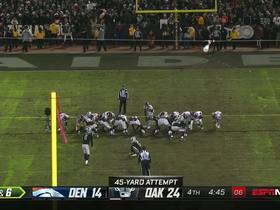 Oakland Raiders kicker Daniel Carlson nails a 43-yard field goal against the Denver Broncos. 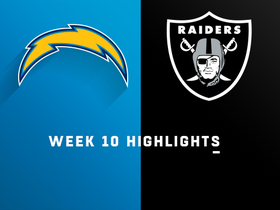 Watch the game highlights from the Week 10 matchup between the Los Angeles Chargers and the Oakland Raiders. NFL Network's Tom Pelissero explains why the Minnesota Vikings cut kicker Daniel Carlson.